UFC Bantamweight Champion TJ Dillashaw is set to take on the UFC Flyweight Champion Henry Cejudo in the coming Sunday's pay-per-view when he fights him for the Flyweight Title. For the fight, Dillashaw has had to lose a lot of weight, heading down to the Flyweight Division to meet the 125-pound benchmark. However, according to the Bantamweight Champion, it is Henry Cejudo who has faced more difficulty in making weight. Henry Cejudo may be the current UFC Flyweight Champion, but before coming to the UFC, he has had his own share of difficulty in being able to make the weight. Twice while fighting for Legacy FC, Cejudo missed the weight and had to fight at Catchweight. 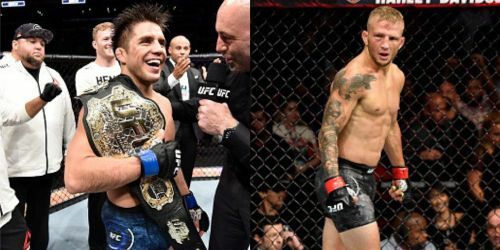 More recently, Cejudo has not missed weight and defeated Demetrious Johnson when he faced him for the second time, to even win the title and become the UFC Flyweight Champion. Dillashaw on the other hand, has never missed weight, and although there was a chance he might fail to make weight when facing Garbrandt, that eventuality did not take place, and he was able to retain his title. When talking to the media for the Media lunch in Los Angeles, TJ Dillashaw answered questions from the media, talking about the trials he was facing in making weight for the UFC Fight Night 143: Cejudo vs Dillashaw main event for the Flyweight Title. "I have an advantage everywhere. He is a great athlete, awesome wrestler, but I don't think that's going to be enough to push him over that edge to handle my pressure, and I'm going to finish him." He talked about how he would be able to take out Dillashaw due to the amount of pressure he would put on him. He went on to talk about how it was easier for him to make weight due to the professionalism he was displaying in the leadup to the fight. "He's had trouble making weight, he's had trouble making 125. I bet I make weight easier than he does." TJ Dillashaw will take on Henry Cejudo on the 19th of January, facing him for the Flyweight title.